TThe GearWrench 4WD Spindle Nut Wrench removes spindle nuts on 4 wheel drive vehicles, features uniquely designed lugs for maximum strength, can be used with 1/2'' square drive tool, will work on Ford vehicles with ratcheting type lock nuts on the front axle, and do not use with power tools. 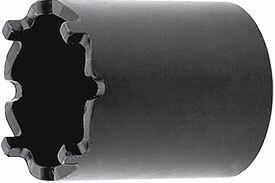 The 2467 GearWrench 4WD Spindle Nut Wrench is one of thousands of quality tooling products available from MRO Tools. Please browse GearWrench Wheel Tools for tools similar to the 2467 GearWrench 4WD Spindle Nut Wrench. 2467 GearWrench 4WD Spindle Nut Wrench description summary: GearWrench 4WD drive spindle nut wrench. 4 Lug 4WD Spindle Nut Socket, 1/2 to 3/4 Ton Dana 44 Quantity discounts may be available for the 2467 GearWrench 4WD Spindle Nut Wrench. Please contact MRO Tools for details.